"So, my supervisor asked me to let you know that since you're doing so well, you'll be 'graduating' from hospice in two weeks. We're sorry, but we have to discharge you from our service." I watched his face for his reaction to the news. "Wow," he said. "I had no idea that was gonna happen. Do I really have to be discharged?" "Well, based on the relatively strict guidelines, I'm afraid so. Your breathing is better, your kidney function has improved, your appetite is steady, you've gained ten pounds, and you're getting out of the house almost every day. Medicare has very strict criteria for being on hospice, and you no longer meet the criteria. I know it's scary," I continue, "but you have your family nearby, and your doctor agrees that you're doing amazingly well." "Yeah. I have to admit, I'm feeling pretty good," he replies. "My doctor is wonderful, and you have all been so helpful. But couldn't I still have a visiting nurse once a week or so?" He looks at me plaintively. "Honestly," I reply, "we would love to supply you with a non-hospice visiting nurse, but you don't meet Medicare's homebound criteria, and since you go out almost every day and it's not physically a burden to do so, Medicare says you don't need a visiting nurse. It's a lot of bureaucracy, really, but our hands are tied." "I understand," he says. "But if my son and I need help with medications or anything like that, no one at the doctor's office will really take the time to help us. They're just too busy. I need someone to sit with me at my kitchen table and sort it all out." "That's a problem many people have, and the government doesn't feel we should be able to help you with that if you're able to get out of the house and to the doctor's office. If you still feel you need help and don't qualify as homebound, you have to hire a private duty nurse, which we know can be an expense that many people can't afford." We sit in silence for a few minutes. The dog scratches himself, the clock ticks, and a car horn disturbs the quiet summer day outside. Not many months ago, this man was told he was dying. Now, one look at his healthy coloring, calm breathing, and relaxed demeanor tells a different story. "Well, it could be a whole lot worse," he says. "I could be even sicker than I was before, and getting ready to die. I guess a lot of people would be thrilled to graduate from hospice." "Yeah, some people just turn it around and we're amazed at how well they do, and you're one of those people," I say. "And while we're sorry that we're forced to discharge you, we're also happy that you're doing so well. And we feel OK about it because you have such a supportive family." "You're right. I'm lucky and blessed. I appreciate everything you people have done. I'll be OK. The doctor's right up the street, my son comes almost every day, and this dog is my really best friend." He rubs the sleeping dog's belly with his foot, and the gentle creature stretches and yawns. "Well, your regular nurse will be back out to see you one more time next week. If anything comes up before then, just give us a call. It was a pleasure meeting you, and I'm sorry I had to be the one to give you the news." I move towards the door. "It's no problem," he says. "You're doing your job and telling me like it is. I know I'll be OK, and when I need you again, my doctor can refer me." "Hopefully that won't be for a long, long time," I say as I open the door, the hot summer air hitting me like a moist wall. "You're welcome. Take good care, now." We shake hands and I walk to my car. Working for hospice, every visit has the potential to be so very different. Today, I had the pleasure of telling someone that they're simply too well for our services to continue. Next time, I might have to tell someone that their loved one has less than 24 hours to live. It can be a roller coaster for everyone---nurses, patients and families alike---and there's no telling when a sudden change might send all plans out the window. For now, this particular person gets a reprieve from the specter of death, and we get to break the good news. The summer sun shines bright. A brief rain dries quickly, steam rising from the hot asphalt like wispy ghosts. I rub my eyes, turn on the radio, and head back to the office. Over the course of the summer, I have been working several days a week at my former place of full-time employment while several of my colleagues take well-deserved vacations. As an agency that specializes in the care coordination and care management of the urban poor who live with chronic illness, it is by nature a challenging and potentially draining job. I was a living testament to the vicissitudes of the position, resigning in January of this year after eight years of hard labor. With chronic stress and stress-related illness, I knew that it was time to go (and that my departure was more than likely long overdue). Still, going back to my old office is like "Old Home Week" and my level of comfort there is still considerably high. Seeing several patients on a regular basis (albeit temporarily), I noticed how easy it is to get emotionally attached again. After four weeks of regular visits to one disabled and chronically ill couple, I was already falling into patterns of the Nurse Care Manager: ongoing "in" jokes with my temporary patients; an increasing feeling of comfort with what was at first an uncomfortable and new home environment; positive mutual regard; and a sense that I could make an impact on these individuals' lives through small but thoughtful actions and kind, carefully chosen words. Conversely, the down side of such closeness also begins to rear its head quite quickly as well: a sense of dependency from the patients towards me; a feeling like I could never do enough; a feeling that I now "owned" this patient's care and had to resolve everything or it would never get done. These are warning signs that I am still not ready for full-time work, for case management, for the responsibility and boundaries that are part and parcel of carrying a caseload. As a per diem hospice nurse for a local visiting nurse agency, I am now finishing my orientation and will begin seeing patients as needed when my colleagues are on vacation or sick. Again, here is another opportunity to have intimate and personal contact with patients and their families, mitigated by the fact that I am "just a per diem nurse" and am not assuming responsibility for their care over the long term. Attachment in my line of work is normal, expected, and healthy. Staying in one job for a long while (like I recently did for eight years) and managing the care of the same patients for that long a period of time can be quite challenging. Projection, transference, counter-transference and a host of functional and not-so-functional issues emerge. Yes, it is great fodder for personal development, emotional growth, and spiritual practice, but it is also rife with danger for those who, like me, can be challenged by the boundaries that must be clearly delineated in order for one to remain healthy in such a position. Personally, I am still happy to not be managing anyone's case at this point in my career. As a per diem nurse, I show up, I do my job, I engage with patients as deeply and fully as the situation allows (and hospice certainly allows for such engagement), and at the end of the day, I go home and rest my head, free of the long-range planning and calculating that make case management so very exhausting. I still feel emotional attachments to some of the patients that I managed for those eight long years. Working at my old office, I run into one or two here and there, or even schedule a visit when it's clinically appropriate to do so. However, I am happily disengaged from all of those nurse-patient relationships that drained me for so long, and my case manager hat gratefully rests on a dusty peg in a dark closet. Attachment is lovely in clinical relationships, but at this point in my life, only short-term attachment holds an appeal. When a patient is in front of me, I am wholly there, present and accounted for. But when I go home to my personal sanctuary, I give thanks that there aren't still eighty people living in my head from dawn to dusk, clamoring for attention that I have no energy to bestow. I should count my blessings every day. Barack Obama, the presumed Democratic nominee for President, faces a tough crowd when talking about healthcare in America. As a nurse, I myself am a tough crowd, and my cynicism towards politicians of any stripe runs relatively deep. In my (potentially naive) hopes for a universal, single-payer health plan for all Americans, I see potential for such a future in some of Senator Obama's positions, but when it comes to his chances (and true motivation) to deliver the goods, my jury is still definitively out. At face value, this sounds like a wonderful idea and I'm interested to know the details. I heard similar rhetoric from the Clinton Administration in the early 90's (and we all know how that panned out). Still, the sentiment---of universal coverage regardless of pre-existing conditions and no change to current premiums---makes some salient points. Further on, the data is there for all to see: an estimated 47 million uninsured Americans, including 9 million children. Health insurance premiums have risen four times as fast as wages over the last six years, and less than 4 cents of every healthcare dollar is spent on prevention and public health. I agree that all of the points outlined above are like music to this nurse's ears. With portability, 100% eligibility for all Americans, expansion of Medicaid---it all seems too good to be true. The site continues to describe plans for lowering costs by modernizing the healthcare delivery system, disease management programs, team management of chronic illness, patient safety, independent research on effectiveness, a comprehensive effort to redress health disparities, and stronger anti-trust laws with a goal of decreased malpractice insurance premiums and fewer lawsuits. Obama's plan also addresses the need for electronic medical records, less reliance on paper charts, and increased competition for drug companies and insurers, not to mention increased biomedical research, an expansion of the global fight against AIDS, support for Americans with disabilities, mental health parity, lead and mercury poisoning prevention, and increased research related to Autism. 1) The nursing shortage: although Senator Obama's plan states that the number of "primary care providers and public health practitioners" are dwindling, the plan makes no mention of nurses, the (global) nursing shortage, and the need for massive investment in training, increased nursing faculty, loan programs, and other incentives to a) keep nurses in the workforce, b) prevent burnout by decreasing nurse-patient ratios, c) provide financial incentives for those who wish to be nursing faculty, and d) expand enrollment in nursing education. Where does he stand on the nursing shortage, and how can he not consider it a cornerstone of any meaningful national healthcare policy? 2) Schools and student health: although the Senator's plan addresses the need for expanded physical fitness in schools, improved use of lunch programs, and "more healthful environments" in the nation's schools, the plan fails to mention that although the federal government mandates that there be one school nurse for every 750 children, the national average is more than 1,110 children per nurse, with some states far exceeding even that number. Nurses are essential to the health of our school-age children, and Senator Obama seems to have overlooked this very important point. However, we can rest assured that there is a full-time nurse on staff in any private school attended by Mr. Obama's privileged children. 3) Dental coverage: it is widely understood that dental health is one of the most important forms of preventive healthcare, but the Obama health plan fails to mention dental care in the large or the fine print. Millions of Americans who indeed have health coverage through their employers or a private insurance plan still lack dental coverage for even the most routine care. When it comes to the prevention of infection, improved immune function and proper nutrition, dental care is paramount. Unnecessary tooth and bone loss, oral cancers, and preventable complications from dental diseases are truly public health disasters. If the plan for American universal coverage does not include universal coverage for preventive and corrective dentistry, a serious source of chronic health problems will not have been addressed or alleviated. I am in no way a policy-oriented person, and when it comes to politics, I tend to sit on the sidelines and watch the wheels turn (with the occasional blog post for good measure). Mr. Obama's healthcare plan is impressive in both depth and breadth, and if he can actualize his plan in the real world, we will certainly be considerably more better off as a nation than we are now. As far as the blind eye that the Senator has turned to the nursing shortage (at least as far as his healthcare plan is concerned), he would do well to realize the importance of nursing to the success of any national healthcare agenda and address the very realistic concerns which nurses have raised again and again. As I said earlier in this article, my jury is still out vis-a-vis Obama's ability to actually manifest his vision when the campaign is over and the ticker-tape has been swept from the streets. History has illustrated again and again that "politics-as-usual" can rear its ugly head quite quickly when the mad dash of the campaign season is over. Obama's hardest fight will not even begin until he sits in that famous Oval Office and attempts to wrestle with the troubles of the day. Will his ambitious healthcare plan survive the deluge of responsibilities and decisions (and special interests) which will make themselves painfully known after January 20th? Will he see that nurses really matter, and then succeed in bringing their needs to the table? This (somewhat cynical) nurse isn't so sure, but I am willing to give the Senator the benefit of the doubt as long as his efforts remain focused on the needs of ordinary Americans, and not on the desires of lobbyists, insurance company executives, Big Pharma, hospital CEOs, and others who feel that their agenda should supercede that of the American citizenry. It is the uninsured, the disabled and the working poor (and their children) who truly carry the burden of our dysfunctional and top-heavy healthcare system. With more money spent per capita on healthcare than any other industrialized country in the world, the United States ranks embarrassingly low in terms of poverty, infant mortality, obesity rates, and many other statistical markers of overall public health. This is a travesty. Transforming American healthcare is at best a Herculean task of enormous proportions, and any president who shoulders the burden could also be compared to yet another long-suffering mythic figure, Atlas. We can only hope that a President Obama would not instead become a figure more akin to Sisyphus, the mythical man doomed for eternity to roll a boulder up a hill every day, only to have it roll to the bottom before he begins the struggle once more. Mythically speaking, I believe that Sisyphus most accurately (and sadly) represents the life history of healthcare reform in America, with Bill and Hillary playing the parts of the last unlucky Sisyphean figures to traverse that cursed hill. Obama will struggle against many forces united to defeat a movement towards healthcare parity for all Americans, and the interests with the financial wherewithal to thwart such a struggle are more powerful than most of us know. While my cynicism often gets the best of me, I do indeed hold out hope for a healthcare system that can function smoothly and efficiently, keep costs under control, improve public health, advance research, reverse the nursing shortage, and address the myriad concerns mentioned in this and thousands of other diatribes about the current state of healthcare in these United States. I wish Mr. Obama Godspeed in attempting what has been up until now an impossible task, and I will continually strive to keep my cynicism at bay as we move closer to the day when a new administration assumes its (Sisyphean?) place in the Oval Office. Just the other day, I had tea with a good friend and talked about life, love, and our own pursuits, both professional and personal. This friend, with whom we have reconnected very strongly in the last year or so, is a man of great insight, knowledge, sensitivity and kindness. While I historically don't usually enjoy the company of men a great deal (and consequently have few good male friends) this person feeds my soul in a way that is unique and enlivening. Without going into details, I will simply relate that my friend lives a life much different than mine, having neither employment nor living arrangements which are permanent or fixed. By choice and by circumstance, he chooses to live his life on a certain societal edge, eschewing the trappings of the middle-class (mortgage, material possessions, etc.) while maintaining an intellectually rigorous and spiritually rich life filled with people, travel and a curiosity for experience. Questioning him about his life and the vicissitudes of not necessarily knowing where he will be living or working in a month or so, he made the following revealing statement: "I am very comfortable with a high level of uncertainty in life." A high level of uncertainty. It reminds me of a book by Pema Chodron (the Tibetan Buddhist teacher) that I recently read: Comfortable with Uncertainty: 108 Teachings. This friend's simple statement, while not revelatory at face value, was like the proverbial whack over the head with the baseball bat of truth. It is a simple statement, but a statement that belies a faith in the process, a desire to leave one's self open to what's next, and a trust that life will deliver the goods in a way as yet unseen or understood. My friend's bold embracing of uncertainty on all levels emboldens me to see that my life as I have created it is rife with certainty and solidity, while still being flexible enough to warrant the ability and opportunity to open myself to the unknown. Blessed with so many positive attributes, my life is a work in progress that allows me to avail myself of a broad range of possibilities and potentials far beyond what I can perceive with my five senses. If I were to allow myself to sink further into the potential that characterizes the future, I might find that my level of comfort with that uncertainty is probably higher than I may give myself credit for, despite the fear that creeps in around the edges. Time with a friend can be well spent, especially when that friend gives the gift of insight without even trying. I am embracing the uncertainty today, and embracing the fact that I can sit with it and not necessarily perceive it as a threat. The future may be unwritten, but the way is already paved with my willingness to meet it head on, comfortable enough with uncertainty. Please stop by and see what's new in the nursing blogosphere. Basically, I was chosen as the one nurse blogger in the United States who will receive a generous stipend to blog several times each month on issues salient to healthcare reform and the current crisis in healthcare as we prepare for the presidential election. It is a very big task and I’m still preparing mentally for the challenge. I would appreciate any guidance or advice, as well as links to articles or websites that might be fodder for my writing process. "I’ve been a fan of Keith and his writing for a long time, and if anyone can make sense of our health care issues as we go into this election, he’s da man! And trust me, there is lots of fodder out here , so be sure to send Keith any information you think he can use! "As if this weren’t enough, Keith is working with a new nursing community entitled “NurseLinkUp”. I just checked it out, head on over and say hi!" Grand Rounds Celebrates Its 200th Edition! The 200th edition of Grand Rounds (the first and most famous medical blog carnival on the Internet) is now up for your reading pleasure at the popular medical blog, Grunt Doc. For those of you not yet acquainted with blog carnivals, they are like online magazines usually devoted to a particular subject, featuring links to posts by multiple bloggers, and usually "hosted" by a different blogger every month. Change of Shift is a nursing blog carnival founded by Kim over at Emergiblog , an award-winning nursing blog of which I am exceedingly fond. For a directory of blog carnivals, visit Blog Carnival , a clearinghouse for such online wonders. Do you want to pass some time reading some of the best writing by and about the healthcare field? Grand Rounds and Change of Shift are the places to start. The nursing shortage is here to stay. At least that's where the signs all seem to be pointing. From reports of teachers doing the work of school nurses to a profound lack of nursing faculty, the shortage---predicted for years by many in the know---is an inescapable phenomenon with far-reaching repercussions. For instance, the Joint Commission (which is responsible for accrediting American hospitals and other healthcare facilities) has stated flatly that up to 100,000 preventable hospital deaths per year in the United States can be attributed to the nursing shortage. Additionally, the Department of Health and Human Services' Agency for Healthcare Research and Quality estimates that adding one patient per nurse per shift in U.S. hospitals increases the risk of hospital-based complications by as much as 17%. But how, pray tell, can hospitals decrease nurse-patient ratios in the face of such massive shortages of personnel? As individual states consider passing legislation to decrease nurse-patient ratios, some state legislatures---like the Massachusetts Senate---seem deaf to the cries of nurses and patient advocates for mandated nurse-patient ratios that will serve to protect both nurses and patients from unnecessary injury. And in the midst of such a shortage, over-working nurses to the point of attrition from the profession is wholly counter-productive. When it comes to educating new nurses, the American Association of Colleges of Nursing (AACN) predicts a shortage of up to 500,000 nurses by 2025, exacerbated by a severe shortage of nursing faculty across the United States. With 40,000 qualified applicants turned away from nursing schools in 2007, how will the shortage ever truly be addressed as nurses (and nursing faculty) of the Baby Boom generation begin to retire in droves? This AACN fact sheet apparently says it all, and the picture that's painted is anything but pretty. As the average age of nurses climbs towards 47; as schools of nursing turn away students in record numbers; as Baby Boomers retire and nursing faculty follow suit---how are we to stem the tide? Faculty salaries cannot keep up with inflation, nurses are recruited heavily from region to region, and overworked nurses burn out as they care for too many patients. From Canada to Prague to South Africa, more nurses are needed than schools can produce as nurses retire faster than they can be replaced. The story appears to be the same around the world, and governments, facilities and organizations seem to be scrambling for a multitude of solutions. This writer does not purport to know the answers, and as I read the news, talk with nurses, and read what nurses throughout the blogosphere have to say, the nursing shortage is having a far-reaching ripple effect that touches on every aspect of medicine, health, healthcare, and community. Nurses are essential to the health of myriad communities. Visiting nurses keep patients safe when they come home from the hospital with acute medical and nursing needs. Hospice nurses provide support for patients and their families as they navigate the dying process. Medical-surgical nurses keep hospital units running smoothly, safely, and efficiently. School nurses dispense medications and tend to the (often complex) medical needs of our children. Office-based nurses serve as the backbone of many private and group medical practices, and advanced practice nurses provide specialized medical care in settings where a doctor is neither available nor necessarily essential to good patient outcomes. In the coming months, it will be interesting to see how the two major political candidates address---or fail to address---the nursing shortage. Barack Obama may have shadowed a nurse for ninety minutes, but a few hours in scrubs does not a policy make. And when it comes to national healthcare for the masses, if there are no nurses to deliver that care, then the plan is moot from the start. As far as this writer is concerned, any national healthcare policy debate that does not take into consideration the very real shortage of nurses in this country is a debate lacking an essential ingredient. Yes, the nursing shortage is apparently here to stay---at least for the foreseeable future---and the resolution of this crisis is a goal in which every citizen has a serious stake. I would like to announce that I was thoroughly shocked and humbled this week after learning that I was selected as the national winner of the Value Care, Value Nurses Blogger Scholarship. I applied along with many of my nurse blogger friends and colleagues, and never suspected that this honor would be bestowed upon me at this juncture in my blogging career. Under the auspices of the Service Employees International Union (SEIU), Value Care, Value Nurses is a national campaign to raise awareness by promoting nurses and nurse-based solutions to the current healthcare crisis in the United States. I will be posting several times per month here on Digital Doorway about salient issues related to nursing, healthcare, healthcare reform, and the presidential election, and will actively seek out other bloggers writing about similar topics. So, my gratitude to the SEIU and the team at Value Care, Value Nurses. I only hope that I can fulfill the expectations that are part and parcel of this stimulating process, and I hope that you, dear Readers, will follow my progress into these challenging and exciting sociopolitical waters. He lay there in the bed, feet extended in permanent contractures, arms curled at his chest, immobile. Ulcers burrow deep into various parts of his body: sacrum, hip, elbow, shoulder, right ear. He is non-verbal, eyes intermittently open, but what---or if---he sees is up for conjecture. At this point of the end of life process, there are no more fluids being given, and no more food. Morphine is delivered via a pump that sits on the bed-side table like a silent sentinel. A small needle is inserted under the skin in a part of the body where there is still some semblance of subcutaneous fat. Once there is absolutely no fat left, this mode of delivery may not work as well. A "rattle" is now heard in the chest as fluid builds up in the lungs. One really needs no stethoscope to know what's going on. With the kidneys shutting down, whatever fluid is in the body simply shifts into places where we can hear it make its presence known. One of the most disturbing things to family members and loved ones is the gurgling in the throat. Fluids with nowhere else to go sit in the throat, and this disconcerting sound can be heard whenever the patient takes a breath. Medications like scopolamine and hyoscyamine are given under the tongue or as a patch behind the ear to dry up these secretions, decrease drooling, and literally quiet the noise. Speaking of breathing, as the end approaches, periods of apnea ensue, the patient taking a breath and then pausing for five, ten, even twenty seconds at a time before taking another one. Family members witnessing such an intimate and painstakingly slow process can literally be on the edge of their seats as they wait for the subsequent breath. These apneic pauses where breathing simply suspends become longer and longer, until the fateful moment arrives and an apneic pause simply extends into eternity. The moment of death, long awaited and often dreaded, can be wholly undramatic. The patient takes a final labored inhalation, and the exhalation simply never comes. Last September, we watched my step-father go through this process, and that last intake of oxygen hung in the air like an unfinished promise, all of us anxiously encircling his bed, our own breath held tight in anticipation of an end we knew was so very, very near. When the life in the body ceases, when all animation leaves the face and the eyes become vacant and literally lifeless, that is the moment when mourning begins. Anticipatory grief now gives way to active grieving for the one who has exited this world. Death at home is not an emergency, and families can take as much time as they want as they sit with the body of their loved one. Once those informational telephone calls are made, the hospice nurse and the funeral home director will arrive on the scene, and the removal of the body becomes the focus. When my step-father died, I suggested we wait an hour or two before making any official calls, simply taking some time to be in the room with his body, admiring his peaceful demeanor and the way the cessation of all suffering had smoothed his brow. I have encouraged other families to do the same over the years, and now as a hospice nurse, I will make it my mission to allow patients' families that gift of time following death's arrival at the doorstep. Death is an intimate and beautiful process, and allowing it to happen in the home---where life is a constantly unfolding moment---is one of the greatest gifts that we can give the patient and the family. Years ago, prior to the medicalization of both birth and death, those two very crucial life processes almost always occurred at home. Now, as rare as it may be in our industrialized culture, birth and death have once again gained some ground at home, with many families reclaiming the home-based intimacy and immediacy of beginning and ending life in the family nest, in the crucible of family life. Death, that most inevitable of processes, is something we know can be given as a gift to both the patient and the family, stripped of unnecessary medical drama, its pathos and emotional gravity intact. With the patient comfortable and free of pain, this passage now becomes one that can occur within the context of home life as children play in the yard and soup cooks on the stove. The patient can now take his or her leave, comforted by the voices of children and the familiar smells of home. Did I say that a tranquil death at home was a gift? Yes, it is a gift wrapped with love and sealed with the ribbon of compassion. 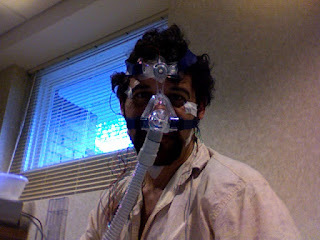 Last night I underwent the second in a series of sleep studies to determine the best treatment for what appears to be relatively severe obstructive sleep apnea. 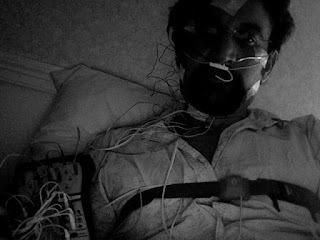 My apnea was discovered a number of months ago when I underwent my first sleep study due to symptoms of Restless Legs Syndrome. That study did indeed prove that I have Period Limb Movement Disorder, and medication now controls those symptoms exceedingly well. However, when it comes to apnea, I am indeed stuck between a rock and a hard place (when, in fact, I would rather simply have my head on a nice soft pillow). 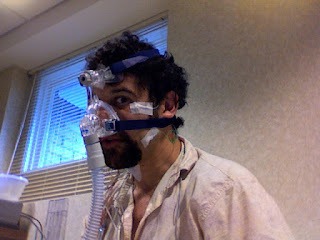 Now, for the past several months, I have been using an expensive custom-made dental device that does indeed help to keep my airway open when I'm sleeping, but unfortunately is causing potentially permanent changes to my bite. So, dear Readers, what is the long-suffering and apneic nurse to do? 1) Wear the uncomfortable dental device that certainly does control the apnea but may cause permanent and unwanted changes to my bite? 2) Wear the uncomfortable head gear and nasal mask attached to aforementioned whirring machine every night for the rest of my natural life? Well, we're back home, pleasantly vacated and rested from the toil of the workaday world. Now, if only everyone could afford and enjoy even a brief holiday, then there would be economic justice in the world. But alas, only some of us can afford such luxury, and I am very grateful that this is possible for us. While our vacations are modest affairs, they're still vacations nonetheless, and I bear in mind my relative privilege. Speaking of privilege, sitting here on my porch after a long day in the city is yet another privilege not to be taken lightly. In the urban concrete jungle where I sometimes work (and where my wife works daily), people swelter in the summer heat with very few available ways to experience relief. Hot weather is always worse in the city, as the concrete absorbs the sun's rays and heat is trapped in the streets. Yes, some of us relish the summer as we drive air conditioned cars and dive into well-maintained pools. Of course we should all enjoy what we are so blessed to have, yet we can still bear in mind those who have so much less.